An ex-Governor of Oyo State, Senator Rashidi Adewolu Ladoja on Saturday declared that he will not contest the 2019 governorship election in the state. The Osi Olubadan of Ibadanland who just returned to the Peoples Democratic Party (PDP) made this declaration while speaking on an Ibadan-based radio station, Fresh FM live program tagged ‘Political Circuit’. 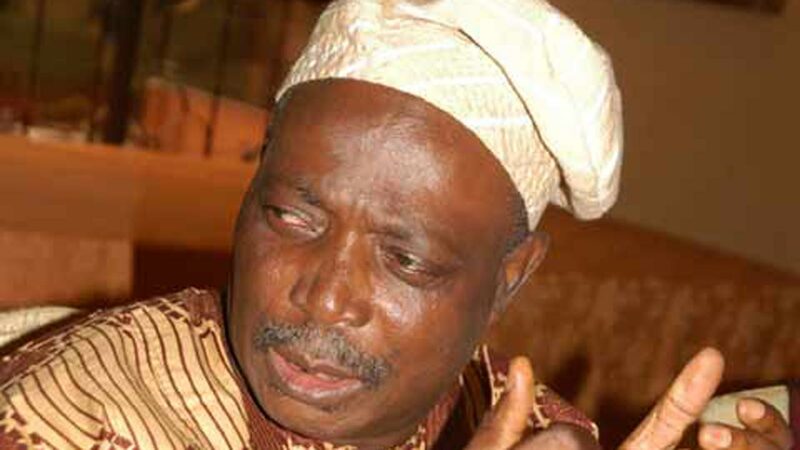 Ladoja who is also contesting the National Chairmanship position of the party explained that he had personal reasons for not joining the next governorship race. He said he was inching closer to the throne of the Olubadan, a position he desires to occupy if God permits. Ladoja said he has other reasons to leave the stage for others because he has done enough in Oyo politics. He said he took the decision in 2015 but his former party, Accord forced him to join the race because of his goodwill and popularity among the people which they believed would help Accord win the election. He said he has had enough of the governorship race, pointing out that it was the part of the reasons he joined the national chairmanship race of the PDP, noting that he would not have joined the chairmanship race if he still intended to contest as governor in 2019. Ladoja however insisted that he won the last election, stressing that he lost at the tribunal only on technical grounds. On why he was contesting for the national chairmanship position of the party, Ladoja explained that his main agenda was to right the wrongs of the past by creating a level-playing ground for all aspirants for all positions in elections across Nigeria. “I was a victim of that. I am contesting to ensure that no other party member falls victim of that. “I will instill confidence in everybody by ensuring there is a level-playing ground for every party member in all parts of Nigeria”, he said. Ladoja said the All Progressives Congress (APC) would not have won the last presidential election if the PDP embraced internal democracy, explaining that the PDP governors who joined the APC did so because of lack of internal democracy. He also denied claims by his former deputy, Adebayo Alao-Akala, that he (Ladoja) won the governorship election only at the time they worked together. He added that he brought Alao-Akala to political limelight when he picked him as his running mate in 2003. He said that despite their political differences, both Alao-Akala and Ajimobi remained his personal friends because he does not mix personal friendship with politics.